A bicycle repairsman who visits you at home. Because the bicycle repairsman is a long existing and good working concept no one had further thought of improving the client aspect. 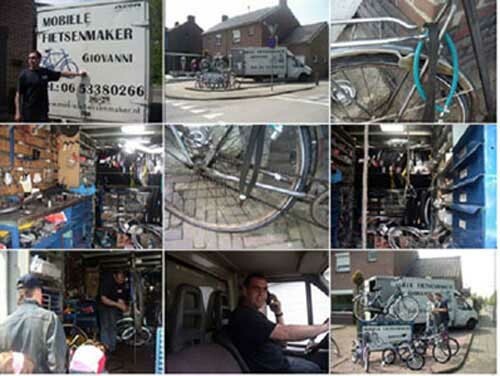 In the Netherlands you could find a bicycle repairsman in almost every neighboorhood and mostly there were even more in the same neighboorhood. These were people who did this job at their own houses on a simple low scale base. But by the time as the quality of the bikes improved these repairsman withdraw from their jobs. Nowadays you can’t find these handy-man any more as much as before. To have a bike repaired now you have to contact a larger professional company and have to make an appointment to bring your bike and a seperate date to pick it up again. So this takes quite a long time and sometimes it’s even a problem how to bring over your bike. The new concept is in principle the same repairsman with the same job. The main improvement is that now this repairsman has a bus in which he has integrated his wrkspace. So now it is possible to bring his worksplace to the customers. So he is a mobile repairsman who can fix peoples’ bikes at instance wherever they want to eg. at home at work on the road etc. etc. This concept has had very much attention since its beginning. Our provider himself has started this concept and for now is the only provider. So actually this would make the concept a unique case. But than again he is ready to recruit other repairsman and provide them with busses for other districts, so this would make the concept ‘ low diffusion’. Another issue is that a franchising company called ‘ Fietsnet’ is preparing a fullscale national project to provide this concept (in about 150 busses) all over the country. So at this stage we would speak about high diffusion. Giovanni has actually simply used the same old techniques of a normal bike repairsman but now he has improved this job by making it available mobile. By the time that our provider started this idea he had bought his bus and integrated all his tools and other stuff for about 15.000 euro. The society is provided with a new solution that helps people fixing their bikes in a very comfortable easy way. So a very worthfull piece of service is added to the society. There are no drastical effects on the environment considering this solution. Maybe a slight pollution due to the mobile worksplace which is a bus that is on the road alll day.